GRAB A MAGNIFYING LENS and GO! This is a revised freebie! 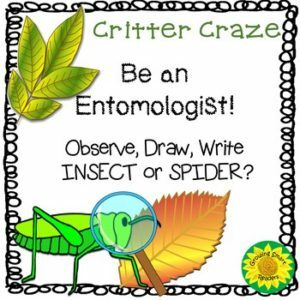 This “Critter Craze” resource gives your kids a chance to get out of the classroom and be an entomologist. They may find all kinds of bugs, not just insects…but even spiders. Be sure to tell them that entomologists study insects as well as other bugs. While insects do have 6 legs, they may find a spider to write about. The “jar” graphic allows them the opportunity to draw their many-legged critter. Follow up with a mini research for more information about their new-found specimen. 2 report frames (differentiated) are included. I hope your kids have a great time with this Critter Craze activity, and perhaps it will be a great jumpstart for writing an insect report. Have fun with this, but remind students to RELEASE THEIR BUGS back into the wild after studying them. ❤Click here to become a new follower!